I sponged the Delightfully Detailed laser cut strip with Lemon Lime Twist, Pacific Point and Tranquil Tide inks. I coloured the rose with Stampin' Blends alcohol markers. The label was cut with one of the Petals & More Thinlits, the top layer was embossed with the Simple Stripes embossing folder and the strip of Blueberry Bushel cardstock was embossed with the Hexagons folder. 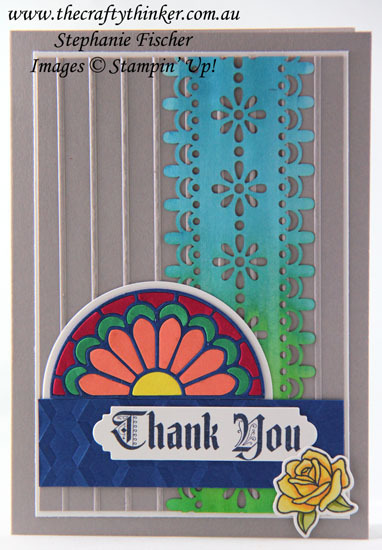 I love the new Graceful Glass Suite (Painted glass stamp set, Stained Glass dies and Graceful Glass Vellum) but there's something about this card that I find a bit disturbing and I'm pretty sure it's the colours. I'm really excited to have the new colour Gray Granite in the colour range - I'm pretty sure it's going to become one of my go-to neutrals. I also really like the new In-Colours, even though I find the Pineapple Punch a little strong - it'll be great in small doses. I think the problem is that I don't yet have any matching inks and it's been a great eye-opener! The truth is that I'd started to take for granted the wonderful array of matching shades, automatically reaching for ribbon, cardstock, patterned paper, inks, markers and embellishments all in matching and coordinating colours. I had forgotten my pre-Stampin' Up days when I spent ages finding colour matches (and they were never exact!) and blending ink colours. So, even though I may not love this card, I'm grateful for the reminder of just how awesome the Stampin' Up colours and products really are! ..... and I'll have some matching inks next week!